Pallet gates are used in warehouse and factory environments to improve safety standards. Here at Midland Handling Equipment, we offer gates for all types of businesses. The most common injury in the workplace in a warehouse environment is falling which is why the demand for better safety measures have increased over the years. These safety barriers prevent danger to you and your employees when loading or unloading goods where you may be exposed to edges. We can accommodate different sized pallets when creating our gates as we know that not all factories are the same size. Our gates need very little maintenance and are easy to use. Pallet gates are designed to withstand conditions both inside a warehouse and outside, including all weathers. Our bespoke designs can match your exact requirements so get in touch with us today for more information. Our safety gates are an excellent solution for mezzanine floors and higher level platforms this is because of the gaps in the handrails that are used for loading, they normally have no safety barrier or a simple chain ‘gate’. Why choose a pallet gate from Midland Handling Equipment? Make sure you and your employees load at height safely with our pallet gates, they are proven to remove the probability of injury in the workplace. If you would like more information on our gates or any other service such as our easi-lift safety gates or oven conveyors then get in touch with us here at Midland Handling Equipment today! Midlands Handling Equipment offers a wide range of Pallet gates that adhere to the safety regulations for different use. The gates can be used for doorway entrances, loading bays, high-level boarding platforms, hoisting platforms and mezzanine floors depending on the type of pallet that you choose to purchase from us. Also referred to as the standard model, this pallet gate is balanced for positive open and close action and also features a toe board installed on the mezzanine edge to protect the workers below. This type of pallet gate is ideal for use in mezzanines with limited space. The design of the gate allows for less space to be used when loading and unloading the pallets. It also features a mezzanine edge side mounted toe board for added safety. It offers the tallest capacity of the Kee Gate pallet gates. It features a cantilever design for the gate which allows for minimum ceiling height requirement. For added safety, it also features the toe board which is mounted don’t the mezzanine edge side. For the wide load capacity, Midland Handling Equipment has the Pallet Gate type D. It allows for maximum load width and a head clearance of up to 2 meters for the workers. These types of pallet gates are made from aluminium with a positive open and close action. There are different types of gates available for different types of warehouses. Midland Handling Equipment will help you identify the best for your application and the size of the structure where you would like to use the pallet gates. Safety in the production line is an ultimate concern and at Midland Handling Equipment Limited we offer a variety of Pallet gates to improve the safety standards of your work in all kinds of businesses. Bespoke solutions – safety hazards differ from one business to the next and we have different sized gates to match the needs of your factory. We also design gates for the different levels and floors like pallet gates for Mezzanine floors, doorways and entrances among others. 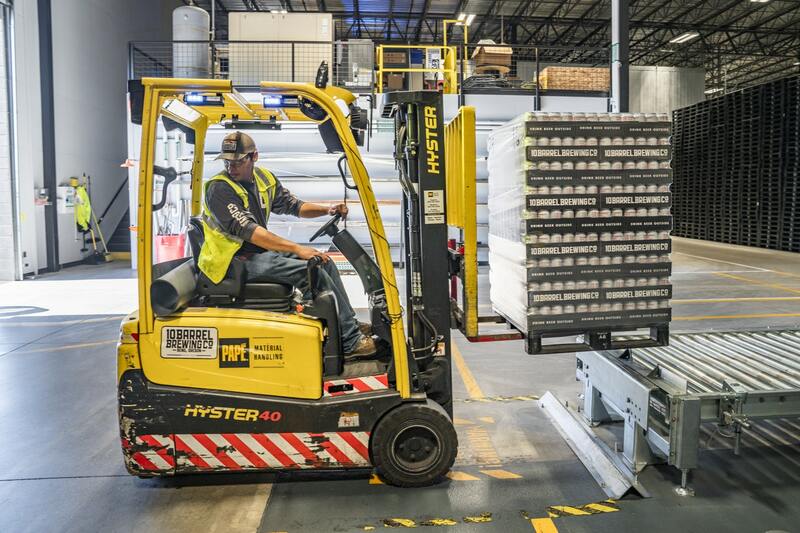 High standards of safety – our pallet gates are not only made of high-quality materials but they are built to drastically reduce the chances of injury to the user. Our gates even come with a bright coloured coat for easier visibility and added safety. Cost saving and effective – other than being able to provide safety to your workers, our gates are also easy and fast to install and require low maintenance over the period of use. When used the right way, it is possible to eliminate the possibility of injury in the workplace with pallet gates. Get in touch with us today for a breakdown of the different types of pallet gates on offer and also for bespoke solutions that are perfect for your business.